I think this might be a case of both/and rather than either/or. Pastor Daniels is right as far as she goes. God absolutely gives us the fortitude to withstand all that the world can throw at us. It is with His help that we carry on when we cannot carry ourselves. I wonder though if there is not something good and true about believing that God will intervene in the most mundane of circumstances? I don’t claim to be a theologian (in fact, without fail, every single time I type theologian I accidentally type theologican first!) and I may have missed the classes that Tim Tebow’s pastor missed as well. But it seems profoundly limiting to suggest that God will not, in some wise, intervene in even the silliest of human endeavors (which they all must seem to Him at times). We have spent the Christmas season celebrating the inbreaking of God into a manger and celebrating the very real birth of God With Us. If that scene teaches anything then it teaches that God embraces us even in the midst of some very human realities – because of those very human realities. God seems to speak less in the grand than in the simple, the essential, and the human – for that is what we might understand. 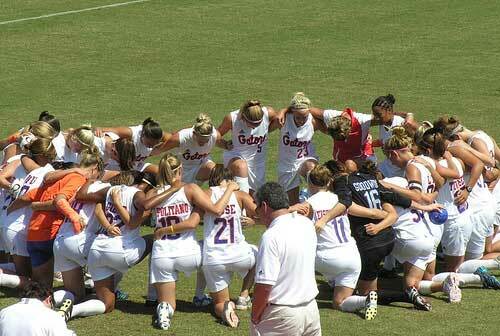 Florida Gators women's soccer team at prayer. Our prayers are always answered. This is a true saying and worthy of all to be received. They may not be answered in the way we understand, the way we hope, or the way we expect. When a team prays for victory and receives defeat, there is grace abounding in defeat. 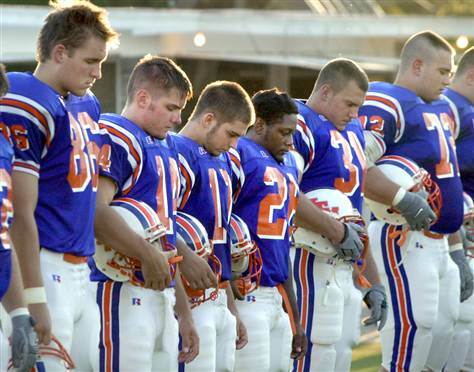 Most of our greatest lessons come not from wins but from losses – and prayers were answered. When a pastor, player, or coach ascribes to the Lord his or her win on a field, they are absolutely right! Their victories and their defeats, their skills and their weakness, their hopes and their fears are all bound up in the love of God. In a profoundly narcissistic society, it does not bother me at all to see Tim Tebow genuflecting in the end-zone. It does not bother me at all for a pastor to say that he thinks God is watching out for a particular team. The point is not that God cares about a ball game – but that the ball game is one part of God. The ball, the field, the players, the sweat, the dreams, the fans, the stadium, the city, and more are all caught up in the care and attention of God. The more we are able to acknowledge the presence of God in all that we undertake the more profoundly we can carry that presence to those who need it most. When I am flying on a flight particularly marked by turbulence I don’t pray that I will have the calm and wisdom to accept the circumstances and, if the plane should crash, that I shall merit particular care in the afterlife. I pray that the plane doesn’t crash. Is God listening? I believe so. It might be an attribution error or a case of post hoc ergo propter hoc but I do think that God hears the fervent prayers of His people. We are not Gnostics – we believe that the material world matters to God. We believe in the Incarnation and a Lord who was, in some way, formed by the everyday love and concern of a Father, a Mother, and those all around. This is part of the exchange of the Incarnation. Pastor Daniels proposes a curiously dispassionate God by whom “all prayers are welcome” yet who does not seem all that interested in responding to them nor to value any of them particularly. This is a curious God to whom we should pray – but only for our own individual resolve to withstand or grow from a particular experience. What does the Spirit do in such a cosmology? What role does God play at all in the Creation? Why an Incarnation? Where is the Living God active and true? Those may seem like grand questions to jump to because we are talking about a football game, right? But what we are really talking about is a question of the efficacy of prayer, the nature of God’s action in the world, and God’s relationship to His people. We don’t pay obeisance to a disinterested sun god, who is content to watch the world putter on, for whom we are an amusement or day’s diversion. We worship a God who has come among us as one of us and knows us as His own. God may not have a scorepad and one of those beerhats on – or he may – I rather like to think he does at times though. The Incarnation revealed to us a God who wanted to know and love His people – in all of their passionate silliness – in all of their victories and defeats. I think what troubles me is the belief that sports are just too petty or small a concern for God to look upon. For the men playing football or the women playing soccer or the boys and girls in the Special Olympics or the countless other men and women competing, striving, and praying – those feats are no mean thing. They are not hobbies or a lark they are the stuff of dreams and longing. They form character and virtue. If God is not involved, deeply and passionately, in every human being’s dreams and hopes (however picayune they may seem from our perspective), then I am not sure what God is involved in. We might, too often, want to constrain His action to look curiously like what we want to happen. Yet, there is something deeply faithful about asking God to intervene in the simplest parts of our days and expecting that God is active in every victory. What threw me more to one side was visiting developing nations, where people of incredible faith were starving to death, while–say–someone with the initials K.K. brought down 12 million last year. At that point I have to say, God may hear prayers of the faithful, but the ensuing actions are wanting at best. AND . . . this all led me here: Jesus does not save us from pain and heartache; Jesus saves us in them. Jesus does not save us from losing football games; Jesus saves us in them. However, Jesus does save all people save one from having to be K.K. You are definitely right, George. This does seem to lead one to naturally ponder theodicy questions. Does God hear some prayers (for seemingly less important things) and ignore others. I think the article by the UCC minister points in a certain direction but only goes so far. I wonder the same thing as I encounter many, many people in stark circumstances. Yet, I think our hope is found in ever-deeper and ever-broader prayer rather than doubting the will, efficacy, or action of God in other places and prayers. God often finds us in painful realities and realizations and that makes our victories and joys that much more poignant and deserving of prayerful thanks. Thanks for the reminder that we are saved in all manner of circumstances. Thank you, Father Robert, for a balanced and truly Biblical approach. You have given us a gracious and yet robust apology for the witness of Scripture, Tradition and reason (or, as I like to call it, Holy Wisom.) Most idolatries can be traced to the vain effort to “put God in a box” (for e.g., J.B. Phillips “Your God is Too Small) by trivializing, domesticating, diminishing, shrinking the Divine into something quite manageable, putting us in charge. I go back and forth on the issue. On the one hand, my opinion of professional football players is quite low because of all of the stupid things so many of them do, so when I see someone kneeling in the end zone, my first thought is that they are doing it just for show, to get attention, to get on the news. On the other hand, I think of “Angels in the Outfield”–God helped the Angels win so that a boy could get a family. So maybe God is working in some way through the Tebow controversy that we can’t even see, and therefore, I give the benefit of the doubt.